With a row of evergreens surrounding the field and Damascus’ Mt Qasioun as a backdrop, the practice field – even though shared – is a near-idyllic recreation venue. Already by 10 am on a blistering June Friday, heat rises in shimmers across the small multi-purpose pitch at Faihaa stadium. At one end, members of the Zenobians run drills and do punishment push-ups and crunches whenever they drop the ball. At the other end, a group of children practise their football (“soccer”) shots. 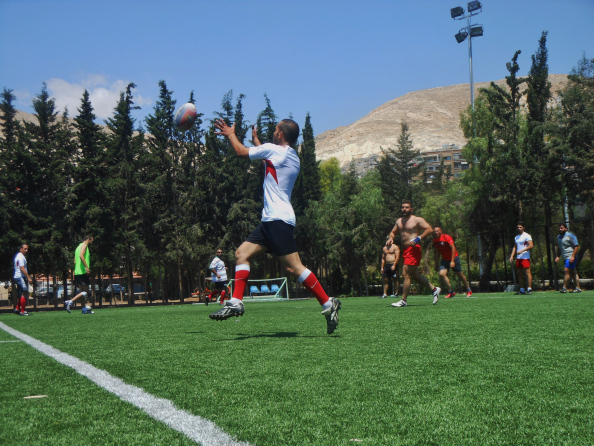 With a row of evergreens surrounding the field and Damascus’ Mt Qasioun as a backdrop, the practice field–even though shared — is a near-idyllic recreation venue. Winners of the “Damascus Sevens” from 2006-8, second place in Egypt’s “Alexandria Tens” in 2009, and first place in the 2011 “Dubai Sevens” –The “Sevens” matches comprise seven players vs the standard fifteen – the Zenobians have overcome a number of obstacles to achieve their successes. A burnt-out mortar hole at the far end of the field evidences the lethal reality of mortar fire. The lack of equipment and of sponsorship are other hurdles they face. Sam al-Akhras, an English Literature graduate, joined recently, in March, to “get rid of all the stress of the war on Syria, by playing an aggressive sport.” Just two months after joining, Akhras took a forced break for a month after being injured by one of 27 mortars fired on his neighbourhood on May 6 (In total, 54 mortars were fired on Damascus that day alone). Mortar shrapnel hit him from behind, puncturing his body from head to foot. A month later Akhras is back running, visibly still suffering from the remaining shrapnel, which pushes against his lung, but determined to play. One of the problems in question is the incessant mortar and missile fire by armed insurgents outside the city. In the months since that June morning, when the only “equipment” the team had were their rugby balls and uniforms, they’ve now acquired tackling bags with which to practise. To do so they – low on funds – pooled their money, looked up the standard specifications and measurements online, and had tackling bags made locally. * Eva Bartlett is a Canadian journalist and political activist. Both photographs are by Eva.